ANNAPOLIS, Md. — The editor of a Maryland newspaper where five people were killed in a mass shooting in June has won the Benjamin C. Bradlee Editor of the Year Award. The National Press Foundation announced the award Friday to Rick Hutzell, editor of Capital Gazette Communications in Annapolis, Maryland. "We saw courage in the face of unimaginable tragedy in the Capital Gazette editor and his staff," NPF judges said in announcing the award. "As pledged, they put out a 'damn paper' the next day, and every day since in service to their community. It underscores the importance of local newspapers and the unbreakable bond with their communities." Hutzell said while the award may have his name on it, his staff and colleagues at the Capital Gazette and Baltimore Sun Media Group earned it. "I did not put the paper out. We put the paper out, together," Hutzell said. Hutzell will be honored at NPF's annual journalism awards dinner in February. The award was established in 1984 to recognize imagination, professional skill, ethics and an ability to motivate staff. The National Press Foundation is an independent nonprofit that is run by and for journalists. The man charged in the shooting at the Capital Gazette newsroom had a history of harassing the newspaper's journalists. 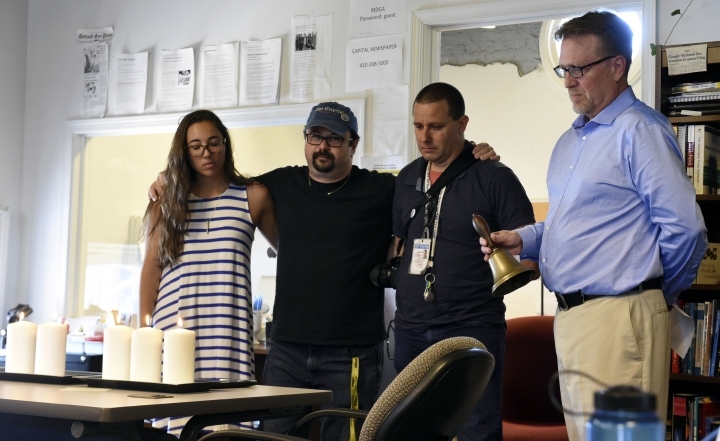 Five of the newspaper's employees — John McNamara, Wendi Winters, Rebecca Smith, Gerald Fischman and Rob Hiaasen — were killed in the June 28 attack.